Thornhill’s longest selling dressage model by German Master Saddler Jorge Canaves. 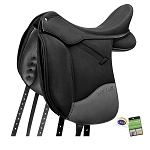 This saddle has been updated (calfskin) but we do have some of these older models still available. Contact me for availability. Sizes: 17", 17.5", 18", 19", 20"
Jorge Canaves' Vienna II has been distributed by Thornhill USA since 1983. Canaves copies "great" European saddles in his plants since his retirement from Olympic competition in 1964. He builds primarily for the European market. This saddle represents a modified version of the original Vienna. 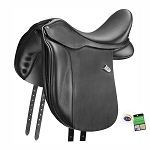 Modeled from a famous Passier® design, featuring a slightly deeper seat, stitched knee pads for maximum contact, a large concealed thigh roll, and a new billet suspension system for maximum stability. 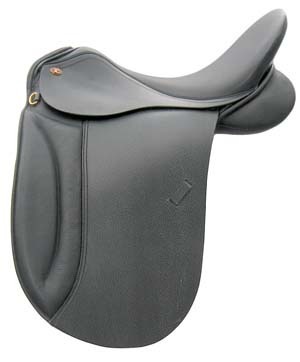 These features combined with this saddle’s excellent center of balance make it one of our most popular dressage models. It's W and XW hoop design tree will fit even the flattest, widest backs out there. Yet, the medium tree offers a perfect fit for those not so generous. About tree widths: The medium tree (32 cm) is for most horses with substantial width (not considered narrow). The wide trees (34 cm) and extra wide trees (36 cm) are for horses with wide backs and / or virtually no withers (e.g. large Warmbloods, Quarter Horses, Percherons). I had an absolutely incredible experience buying my ThornHill dressage from Windswept. Michele was wonderful to work with, answering all of my emails with great confidence and product knowledge. I have now owned my saddle for almost two months and the changes in my horse and my seat have been amazing. Can't wait to share some action shots!